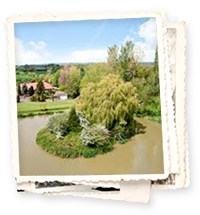 Pittlands Lakes Angling Club is a friendly family run fishing complex located in the Weald of Kent. The club has been going strong for over 25 years and with members from all over the country. All 3 lakes are generously stocked with a variety of fish including Common, Mirror & Crucian Carp, Tench, Bream, Silver & Golden Rudd, Roach, Perch and Gudgeon. In 2008 Chub, Ide and Golden Tench were all introduced. The lakes and grounds are regularly maintained keeping the venue neat and accessible.